We are delighted to announce that since interviewing music teacher and IB examiner, Renée McCarthy for this post about her nomination for a prestigious teaching award, she has been announced as the winner! Renée teaches at Woodcroft College, Australia where her students are so inspired by her teaching, they secretly nominated her for the ARIA Music Teacher of the Year Award. How did it feel to be nominated for the Aria Music Teacher of the Year Award? 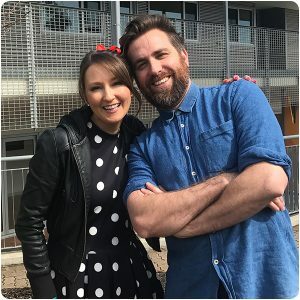 Renée McCarthy nominated secretly by her students for the Music Teacher of the Year award pictured with Australian Singer/Songwriter Josh Pyke – and she won! It was a wonderful surprise: somehow, my year 12 music captains managed to keep the nomination secret, so it was a complete surprise to me; they even roped in the head of the college to complete their submission without me knowing. I received an email in July to say that I had been nominated and it was a beautiful moment to know that my students thought I was worthy of such an award. The real surprise came when ARIA Award Winner Australian singer/songwriter Josh Pyke came to Woodcroft College to announce that I’d reached the shortlist. My 92 piece concert band started playing and as I was conducting I suddenly realised that my amazing students were playing their hearts out for ‘me’. It wasn’t a concert, there wasn’t an audience … 10 bars into our first song I cried. Then Josh entered the room — it is a moment that I won’t forget and I felt very special, very proud to be their teacher and to share that occasion with them. I felt incredibly honoured to be announced as a finalist for this award. How do you inspire a love of music through your teaching? My goal is always to inspire my students to start their own music journey and I do that first and foremost by sharing my passion for music. I wear my heart on my sleeve and my passion for music is evident in every lesson … even theory! My students know that I believe in them and I encourage them to set high standards for themselves; not to achieve the top marks but to be the best they can be. My top tip is to get to know your students and take an interest in their development as musicians. At Woodcroft College we share their music journey together; everyone’s contribution is valued and the student’s love of music continues to grow. How do you think learning to play an instrument can positively affect learning and education? Research shows that learning an instrument can increase your comprehension and improve your mathematics skills, coordination and even your memory. Playing music makes learning easier as it uses both sides of the brain. Music training develops the same muscles that assist in time-management, organisation and concentration, and, learning an instrument teaches perseverance, discipline and responsibility. Most importantly, music has amazing social benefits. Students who join an ensemble or band develop a sense of belonging and purpose when they are actively involved in positive outlets. And, finally, music is a creative outlet for the soul that touches the emotions. Playing music makes people happy! As well as teaching you are also an IB examiner, how has being an examiner helped your professional development? My experience as an examiner has improved my personal development as a teacher in so many ways. Through meeting teachers in schools around the world; participating in workshops, Skype conferences, examining and undertaking IB professional development, I have grown in confidence as a teacher of music and the arts in general. My work as an examiner has enhanced my understanding of the MYP arts guide and the philosophy of the IB and my experiences have made me aware of the global achievements and values of other music teachers. I have now developed a large network of professionals who I consider my friends and with whom I have shared many stimulating discussions and educational debates. I feel incredibly privileged to work in my role for the IB. 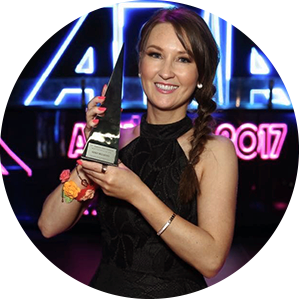 CONGRATULATIONS to Renée for winning the award, aired on Australia’s Nine Network on 28 November 2017. Watch Renée’s acceptance speech here. Do you have a story about an IB teacher who has inspired you? Get in touch with your story and we’ll try and share it as part of our 50th anniversary celebrations, during which we want to celebrate the wonderful work of IB educators around the world.